What makes the difference between a good idea and a great idea? Good ideas come along all the time and help people solve minor problems in work and daily life. Great ideas appear a little less frequently and require a little more work to execute. Great ideas aren’t necessarily the result of highly-paid think tanks or drug-induced vision quests in the desert. Often they are unexpected moments of inspiration that help keep the napkin companies in business. The big challenge of generating great ideas is freeing yourself from the conventional, mundane thoughts that occupy most of your brain time. 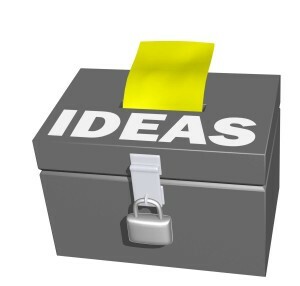 Here are seven tips to help you open your mind and stimulate your great idea generator. Great ideas won’t happen in a vacuum. You need some way of getting your brain to think in new and creative ways. Commit time to specific sessions where you stimulate your brain into thinking differently. Being a New Yorker, my favorite method is people watching. A simple walk through Manhattan can introduce me to exciting activity and behavior that makes me think anew. Any crowded urban area, mall or zoo can do the same. Hanging around with the same friends and colleagues can get you in a thinking rut. Take advantage of all those LinkedIn connections and start some exciting conversations. New people don’t know all your thought patterns and old stories, so you’ll have to revisit your existing inner monologues. The refreshing perspectives will help to surface new thinking and possibly a lightning bolt or two. Books are wonderful for creating new thoughts and stimulating great ideas. For a long time, I didn’t read much. When I added business books to my routine, it helped me learn more and expand my way of thinking. But several years ago, I started again reading fiction and histories. These stories really got me out of my daily headspace and activated my idea generator. Even if you can’t make the time for a novel, go hunt down a bookstore and spend an hour browsing. You’ll find plenty of thought stimulation. Google is great when you know what you are looking for, but the best way to generate new ideas is with unexpected learning. Take an hour each week and go on a web journey. Start with the I’m Feeling Lucky button and just take it from there. Try to pick the stranger and more obscure references as you surf and stretch your brain a bit. It’s hard to come up with great ideas when your mind is crowded with everyday thoughts and concerns. You need quiet space. Meditation will help you clear your mind of daily business and stress. Then you can quietly focus on your future — or solving world issues. Commit to two hour-long sessions every week and soon you’ll find new ideas flowing. Structure breeds creativity. Simple exercises can get your brain working in a focused manner to yield great ideas. My favorite comes from author and Baylor University professor Dr. Blaine McCormick. With a partner, take ten minutes (timed) to come up with 42 ideas on a specific topic or problem. You may only think of 30 or 35 but no matter. You’ll find that there are at least two or three gems in the list. All of these methods require a commitment of time and energy, but that’s the key to great ideas. You need to give your brain the time and space to work for you. If you try each of these methods, you are bound to come up with a great idea or two. Make sure you record them and set a plan of accountability. The execution is up to you. What Really Defines an Entrepreneur?